Asiana is a pretty good airline. The seats were comfortable enough as airplane seats in general. The food on the flight was mainly Korean, so if you are not accustomed to Korean or Asian food, it may be a shock. The service was really good and the flight attendants were all really sweet. ICN-FRA. 3x4x3 configuration for this B474 but were sitting at the back of the airplane where some rows have a 2x4x2 config. Very good legroom even if you are tall. Very good PTV (touchscreen). "does not crowd into your space"
Upper deck with 2x4x2 config. The back is very slim. Thanks to that you get extra space for your knees and face. Even if the seat in front is in full recline position it does not crowd into your space much. The only drawback would be the less padding may cause more stress to your back on loner flights. My 2-hour flight did not reveal that. This is their new A380 seat and the seat is less comfy and a bit hard if you are sitting over 5 hours. I guess that Asiana is trying to squeezing more space for fitting in more economy rows. If you are flying regional say 4-6 hours and it is fine. I am not recommending for flying a long haul flight with A380. The seat was very comfortable for my 10 hrs flight. Long haul flight JFK-ICN-SGN (and vice versa). Very comfy seat with big legrooms. "a little less room for your feet"
The only complaint I have is that the window seat allows for a little less room for your feet. Other than that I love this airline. The staff are amazing and the food is fantastic. "largest legroom I have seen"
SEA to ICN. This was the largest legroom I have seen in a Economy cabin. The seats are well designed comfortable looks clean and have good decline. The PTV screen is huge and there are many programs. Access in/out of seat is easy because of large legroom. 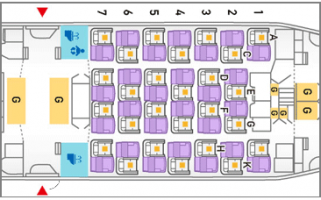 "less padding but not too hard"
Newly configured A330-300 with 245 Y seats instead of 260 in older versions. Reduction of 2 rows gave a couple of inches per each row. With slimmer seat back and added pitch it felt much more spacious. 10.6" AVOD screen was top notch but the programming could be better. Seats had less padding but not too hard. JFK-ICN-JFK on the 747-400; 14 hour flight; seats extremely comfortable! The legroom is excellent 34" lots of space! Recline was superb it felt like premium economy on some airlines the bottom of the seats also slides down which was an added bonus. PTVs were huge 10.6. One of Best economy seats out there!